Back in 2012, we wrote about attending a Crash Party, which introduced the ArtLens App and related gallery (see our blog post: @ClevelandArt #GalleryOne Crash Party). Through this event, we became fascinated with the ways that the Cleveland Museum of Art (@ClevelandArt) uses technology to engage their visitors. 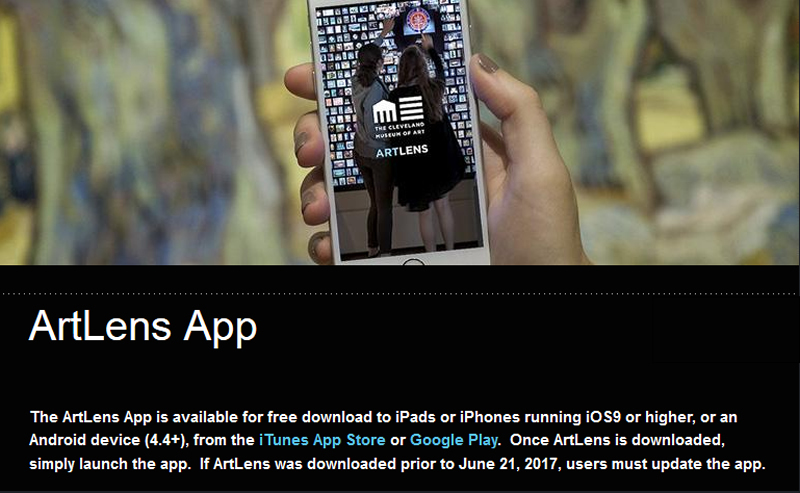 Since 2012, we have visited the gallery and used the app many times and have written several ArtLens-related blog posts. We have watched both the ArtLens App and related gallery gradually evolve to expand their functionality and ease of use. When we were invited by Cleveland Museum of Art Chief Information Officer Jane Alexander (@JaneCAlexander) to attend the 2017 ArtLens Crash Party on June 21st, we knew that major changes were coming -- changes that were not just evolutionary, but revolutionary! The new ArtLens Gallery opened to the public during the Museum's ninth annual Solstice celebration on June 24, 2017, and there will be a formal opening of the ArtLens Gallery on Grandparents Day, September 10, 2017. The ArtLens Gallery section of the Cleveland Museum of Art website, and the June 21, 2017, ArtLens press release give an excellent overview of what to expect from this newly redeveloped gallery. ArtLens Exhibition - "The goal of the Exhibition is to be an experiential gallery that puts you, the viewer, into conversation with masterpieces of art, encouraging engagement on a personal, emotional level....There are 16 new and innovative games, centered on the following themes: Composition, Symbols, Gesture + Emotion, and Purpose." ArtLens Studio - "Designed with the entire family in mind, ArtLens Studio uses cutting-edge technology to give families the chance to use movement and play to connect to the collection." ArtLens App - "...the new ArtLens is a comprehensive overhaul of the app that was completed in two phases, with the first launch in September 2016 and the latest launch in June 2017." ArtLens Wall - "The ArtLens Wall facilitates discovery and dialogue with other visitors and can serve as an orientation experience, allowing visitors to download existing tours or create their own tours to take out into the galleries on their iOS or Android device. The largest such screen in the United States, the ArtLens Wall enables visitors to connect with objects in the collection in a playful and original way, making their visit a more powerful personal experience." Here are parts of the official press release. Note the emphasis on putting artwork first, and using technology to encourage visitors to look at the artwork in new ways, and to explore the Museum with new understanding. ARTLENS Gallery Game Checklist gives a great overview of the variety of activities in the new ArtLens Exhibition. We spent most of our time in the ArtLens Exhibition area, and did not get to try everything -- will need to visit again soon to explore some more. It was fun to watch everyone get excited by the new, intriguing activities. From eye tracking software to interacting with the art by just gesturing, the ArtLens Exhibition felt like it was reaching out and drawing you in to learn more about the Museum's art. Julie noted how it was great to have some of the key pieces of art in the room, so that you could see them immediately after learning about them. We did not visit the ArtLens Studio during the June 21, 2017, ArtLens Crash Party, since we recently played there. The "interactives" in this space are designed so that children as well as adults feel comfortable. Learn more by watching the following Studio Play | The Cleveland Museum of Art video, and by reading our CircleTrek Walking Tour of Cleveland's University Circle blog post about Stuart's first time visiting the studio on October 22, 2016. The "app download time has been reduced to 30 seconds"
It works on iPads, iPhones and Android devices. It is important to note that the ArtLens App has features that can be used from anywhere in the world -- you don't need to be at the Cleveland Museum of Art to use them -- but the App's strength is in visitors using it to explore the Museum's galleries. We recommend using the search feature on the ClevelandArt.org website in partnership with the ArtLens App -- the Cleveland Museum of Art provides so much information that is at your fingertips for free if you already have a smartphone! With the new activities of the ArtLens Exhibition and updates to the ArtLens Wall, we keep learning about new things that the ArtLens App can do. You should download it from the iTunes App Store or Google Play, and go explore for yourself in the Cleveland Museum of Art galleries! Exhibition: As of June 2017, visitors can dock their devices with the ArtLens app at the interactive stations in ArtLens Exhibition to automatically save all the artwork they learn about and all photos taken during game play. Artwork saves to "You" in ArtLens and photos save to your photo album. The new ArtLens Exhibition field on the object page contains additional content about all artwork found in the Exhibition interactives. Galleries: The most significant changes to ArtLens are in the “Galleries” feature with updates to the maps, content, wayfinding and nearby objects. Galleries are color-coded and grouped thematically to facilitate easier navigation. Tap any gallery number to see what type of art is on display in that location or find gallery descriptions by tapping the gallery name. Wayfinding: Create a path to explore artworks. Push the “Find Me” button at any time to find your exact location in the museum, then search an artwork and tap the gallery number to find exactly what you are looking for and how to get there. Content: All artworks on display are identified and findable in ArtLens, with additional multimedia content, including more than 1,500 videos, available for selected artworks. New content is generated on an ongoing basis. Changes to any object on view are dynamically and immediately updated from the backend systems across the app and throughout the museum. Scanning: Using innovative image-recognition software, ArtLens seamlessly recognizes a selection of two-dimensional artworks and provides additional curatorial and interpretive content. You: Favorite artworks by tapping the heart icon on the ArtLens Wall or on individual artworks in the ArtLens App. All favorites are saved under “You.” Favorites can be used to create personalized tours, find specific artworks in the museum or share on social media. Artworks learned about in the ArtLens Exhibition are automatically saved under "You" if a device is docked. Search: Search by artist’s name or by keyword to discover corresponding works on view in the museum. Find the exact location of an artwork identified on a map with a quick tap on the gallery number. Bluetooth: ArtLens now uses Bluetooth to connect to the ArtLens Wall making synchronization seamless, as well as the interactive activities in the new ArtLens Exhibition. Don't have a device? The museum has iPads and iPod Touches available for rental at the desk located inside ArtLens Gallery, near the ArtLens Wall. The rental fee is $5 per iPad. We will hold your valid driver's license or student ID until return. An iPad, iPhone, or Android device is not required to experience many aspects of ArtLens Gallery. The hypnotic ArtLens Wall has always been the most engaging element of the ArtLens Gallery. It was really fun to hear first-time visitors getting excited about it. We wonder how many know that the ArtLens Wall is the largest such screens in the United States! One feature we noticed the night of the ArtLens Crash Party was how the ArtLens Wall docking station lit up when the ArtLens App was connected to it. That feedback was useful. We happily picked some more artwork to save as favorites for use on future visits to the Cleveland Museum of Art. Here are our @sos_jr tweets and retweets sharing our experience at the ArtLens Crash Party. Please share any photos and videos that you find interesting by retweeting. Exciting to be at @ClevelandArt's #ArtLens #CrashParty to see new items in #ARTLENSgallery. Exploring gesture & composition! Gaze tracker. During @ClevelandArt's #ArtLens #CrashParty, I made image which was saved to my iPhone with app. Includes photo of Julie's first time visiting the Cleveland Museum of Art's Studio Play which is now called ArtLens Studio. Read about Cleveland Museum of Art (@ClevelandArt) Chief Information Officer Jane Alexander's (@JaneCAlexander) presentation at TechPint Winter 2016 (@TechPintNews) about some of the incredible things happening with technology at the Museum. Includes tweets about Stuart's first time visiting the Cleveland Museum of Art's Studio Play (now called ArtLens Studio). There are many more blog posts that we have written about the Cleveland Museum of Art and other museums in University Circle that you can read here. Thank you, Cleveland Museum of Art Chief Information Officer Jane Alexander (@JaneCAlexander) and all of the Cleveland Museum of Art staff involved in the enjoyable evening at the ArtLens Crash Party. We look forward to learning more from the ArtLens Gallery exhibits and using the ArtLens App while attending future events at one of our favorite museums! Disclosure: We received an invitation to attend the June 21, 2017, ArtLens Crash Party and two free drink tickets for the event. We were approached to attend because of our support of the Cleveland Museum of Art via our @sos_jr Twitter feed and sosAssociates.com blog posts, plus our interest in the technology used by the Museum. We enjoyed the event, and wrote this blog to share our experience at the ArtLens Crash Party.